Dimensions: 18" x 30" x 3/4"
The mat is light enough so that you can easily move it out of the way when you are sitting. You could even slide the mat under your desk and rest your feet on it while sitting. The UPLIFT Standing Mat is very cushioned and supportive. You will still be able to enjoy the benefits of an anti-fatigue mat on carpet. 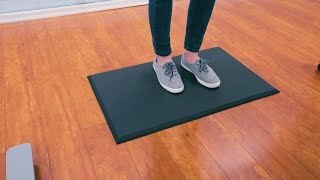 A standing mat is meant to provide extra cushion and support for your knees and feet when you are standing at your desk. You will notice a difference if you spend any amount of time on your feet. The Standing Desk Mat currently only comes in one size and color.